Shop, dine, and walk the Main Streets! Carroll County offers an array of shopping experiences which includes many specialty shops. Stroll our Main Streets to find one-of-a-kind handcrafted items. Our merchants are waiting for you with a smile and a helpful attitude to assist you in selecting just the right gift for family or friends. Don’t forget after a few hours of shopping to rest your weary feet and nurture yourself with some food. Our restaurants, coffee shops and bakeries offer something for everyone, from comfort food to upscale cuisine. Hampstead is a small town in northeastern Carroll County, a historic, family-oriented community with friendly neighborhoods and successful small businesses. Originally occupied by the Susquehannock people, the town center of Manchester is the intersection two past Native American Trails. Be sure to visit the shops and restaurants of Manchester! Mount Airy is a charming small town with first rate businesses. We have it all–from teen clothes and antiques to hunting & sporting goods–in our small, quaint downtown stores. Founded in 1797, New Windsor has had its share of compelling characters and stories, all of which add to the appeal of Carroll County's smallest town. Historic Sykesville is proud of its Old Towne America flavor, with charm and hospitality. It overlooks the Patapsco River and is located on the B&O Railway. 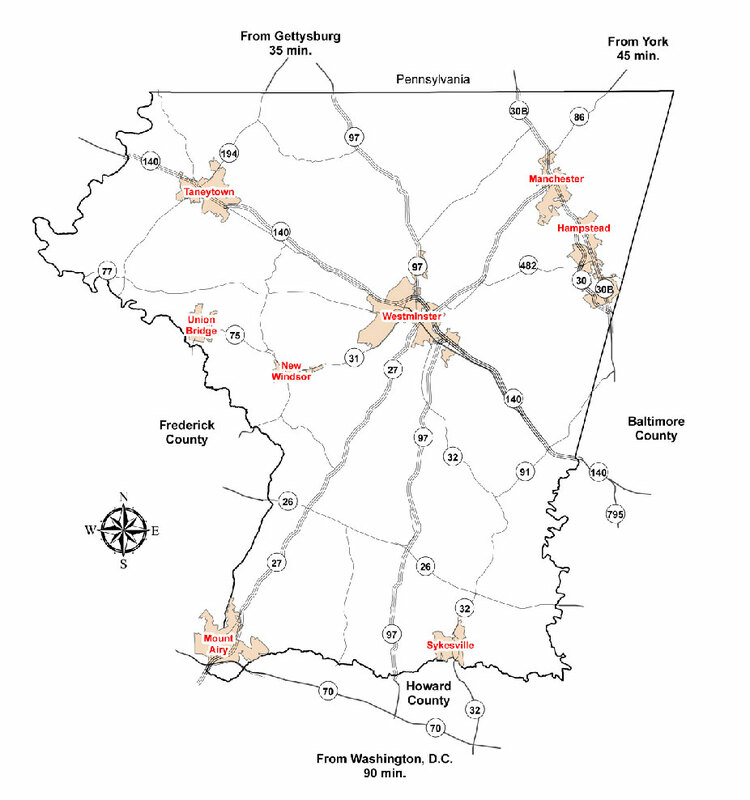 Taneytown began as a small village in the mid-18th Century. It had a small presence during the Civil War, and was also a destination during the Victorian era for its notable department stores and opera house. Union Bridge is a small town that allows you to visit yesteryear: It's like stepping back in time. Visit their Western Maryland Railroad Museum and many charming businesses, restaurants, and stores. Westminster: The county seat and center of commerce! From unique shopping and incredible restaurants to the Arts Center and Historical Society, Westminster is a destination unlike any other!